A brief cooking term lesson. 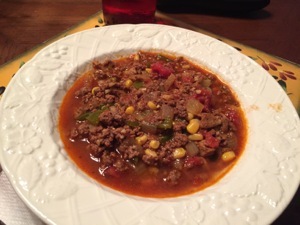 Picadillo is traditionally a Spanish dish that is made from minced, or finely ground meat. Often used in tacos or as part of another dish, it has found its way through many areas of the world with ties to Spain. 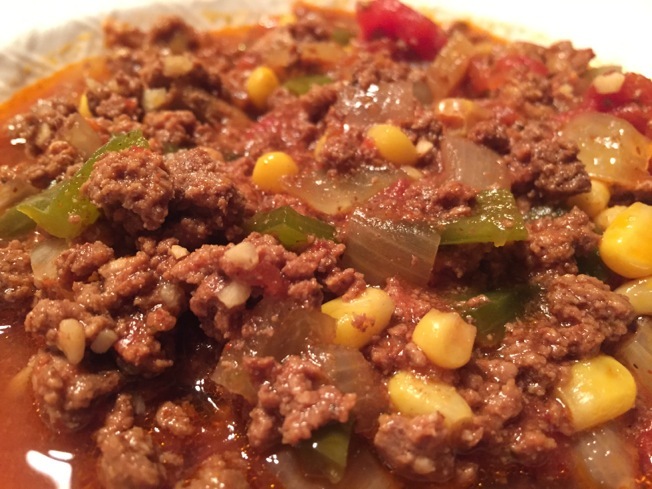 This picadillo has some good flavors to it. I won’t whitewash it, there are a lot of ingredients. The prep goes pretty quickly though. 1. Heat oil in a large skillet over medium-high heat. Add bison (or beef) and sausage and cook, breaking up the bison (or beef) with a wooden spoon, for 5 to 6 minutes. If necessary, transfer to a colander and drain any extra fat, then return to the skillet. 2. 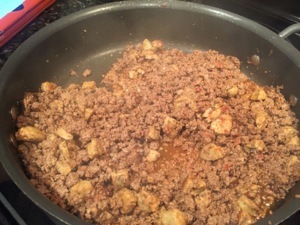 Add chili powder, cumin, oregano and cinnamon; cook over medium-high heat, stirring, until fragrant, 1 to 2 minutes. Stir in water, tomato paste and vinegar until combined. 3. 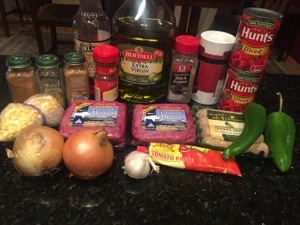 Transfer the meat mixture to a 5- to 6-quart slow cooker. Stir in onion, peppers, corn, olives and garlic. Add tomatoes with their juice. 4. Cover and cook on High for 4 hours or Low for 7 to 8 hours. 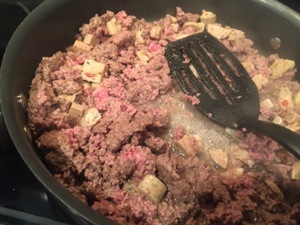 Stir the picadillo to combine and season with salt and pepper. Nutritional Info: Per serving: 311 calories; 16 g fat (4 g sat, 3 g mono); 70 mg cholesterol; 17 g carbohydrates; 0 g added sugars; 28 g protein; 4 g fiber; 551 mg sodium; 455 mg potassium.